Available in Men's Fitting and Women's Fitting. Available in any size, color, logos, labels or graphics with your desired personalize please ask for quote. The standard measurements are attached. We advise our customers to carefully select the desired size before finalizing their order. Attached size table is our size chart and buyers are requested to choose their size according to our mentioned size chart NOT according to what they usually wear. Please feel free to ask size related queries. C u s t o m i z a t i o n Options. Designing Facility Available for Men or Women in Tailor Made Custom Size. Desired Design is available in 1 piece Suit or 2 piece Suit. Desired Logo, Number & Letters Available. We also Can Make customize motoGP and SBK Suits. Perforated Leather Panels for ventilation. Embroidered Logos of any design desired. Item must be unworn, unaltered, and unwashed with all tags attached. All jackets, trousers and suits are stitched based on the sizing chart provided on the listing. Customization can be suit measurements, design, change leather color or printing. If you are unsatisfied for any reason, Please DO NOT be quick to leave negative / neutral feedback. We work hard to make sure 100% satisfaction for our each and every customer. I hope you can give us a chance to solve any problems. Our friendly Customer Service Staff will assist you with all your inquiries. 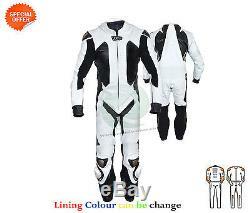 The item "Black and white one piece leather suit with speed hump motogp racing bike suit" is in sale since Wednesday, April 12, 2017. This item is in the category "Vehicle Parts & Accessories\Clothing, Helmets & Protection\Motorcycle Clothing\Jackets". The seller is "a2zleather" and is located in manchester. This item can be shipped worldwide.